Chat messages, emails, websites, books… digitally written text is ever present in our daily life. But those neatly arranged letters hide secrets. Who wrote them and how? Did they hesitate? Was it a furious typing spree fuelled by a wave of emotions? Or did they carefully choose every word, deleting and retyping them over and over? Just like in face-to-face conversation, during typing on a keyboard our entire body sends signals that go beyond the simple choice of words. However, text tools today filter all those signals and leave the receiver with perfectly polished text. A love letter is no different than a job application if you only squint your eyes. Our project sets to experiment on characteristics of interactions with technology that could be perceived simultaneously and interdependently with language, hoping to speculate on alternative ways technology can mediate human communication. Starting with the keyboard and the embodied behaviour dependent on its form, we created Digital Body Language. DBL is a text processor that translates the dynamics of the writing process into typographical distortions. Aspects like speed of typing, time intervals between words, pauses inside words and number of deleted words get mapped into text characteristics like tracking, whitespaces, opacity and font size. By manifesting the embodied behaviour into the static text, we aim to capture attention to the human behind the screen and encourage reflection on the way technology shapes the way we communicate. Digital Body Language was tested in the public areas of Malmo and exhibited as an installation at NordiCHI’18 in Oslo, where participants interacted with a conversational interface. They were asked intimate questions about their family, relationships, childhood memories and life regrets. Their rendered emotional responses revealed their hesitations, breaks, regrets and typing habits. The answers, printed and exhibited together, not only trigger surprise, interest and amusement, but also allow readers to engage with the text in a novel way. The added visual dimensions of the text together with the words generate multiple small narratives around the process, the context and the person, supporting micro-level (over)interpretation. 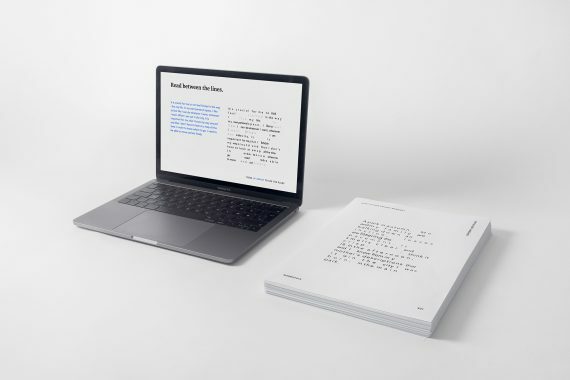 All the exhibited rendered results are being gathered in a database, with an aim of creating a selection of answers in a form of a book, that highlights different individual typing styles and leaves narratives within the text’s form for the receiver to interpret. Digital Body Language is our attempt to engage people with static text and encourage reflection on the meaning hidden between the lines. It is not meant as a tool to facilitate communication, but rather as an insightful experience and data visualization that speculates on digitally mediated communication, and embraces the embodied interaction in a digital reality.